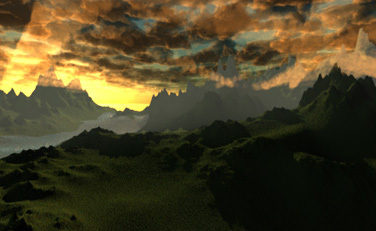 I’ve been experimenting with some atmosphere and cloud creations for my upcoming movie. While doing that I started to get quite happy with the techniques I’m using, so I made a still image of some other environment. Here is the backplate I’ve come up with. The complete image with the foreground elements are rendering as I’m typing this, so I’ll hopefully have it posted to the portfolio tomorrow or the day after. On another note, I added a software section to the website. I’ve been coding on a stats apps for some time, and it’s getting quite advanced and finished as well. So I’m tuning it for it’s release. So be sure to soon see the birth and appearance of Storm|Stats and it will be followed by some other apps I have in the pipeline when time permitting. According to the very sad post about my dear friend Brent I posted yesterday, I’ve been talking with some of the other executives at IMA this night, and we won’t let Brent’s dreams and visions die with him, but we’ll make everything we can to make sure they will live on and let the show be a dedication to Brent’s memory.